Of the dozens of impressive wine regions of California, the Ojai Valley (pronounced Oh-Hi) is one of the most beautiful and certainly one of the most charming for a weekend wine getaway. Located 90 miles north of Los Angeles and only 30 miles from Santa Barbara (another great wine tasting region), Ojai is accessible as a quick day trip from nearby cities, but it also makes a fantastic weekend trip. Not only is Ojai packed full of great wineries, there’s a lot of wonderful restaurants and shops to explore. As you drive into the region, you’ll be greeted by the looming mountain range and citrus groves that line the valley. There are olive orchards and sprawling family ranches. And vineyards surrounding it all. For a town of only around 8,000 inhabitants, Ojai has quite a bit to offer traveling foodies. If you’re planning a trip to this area, be sure to check out some of the fantastic wineries, maybe have a picnic in the countryside, then save some time to explore the town and its lively tasting rooms. Stay for dinner so you can indulge at one of the many high-quality restaurants in town. As you drive into Ojai on Route 33, we recommend taking a slight detour onto E. Old Creek Road to visit the Old Creek Ranch Winery. 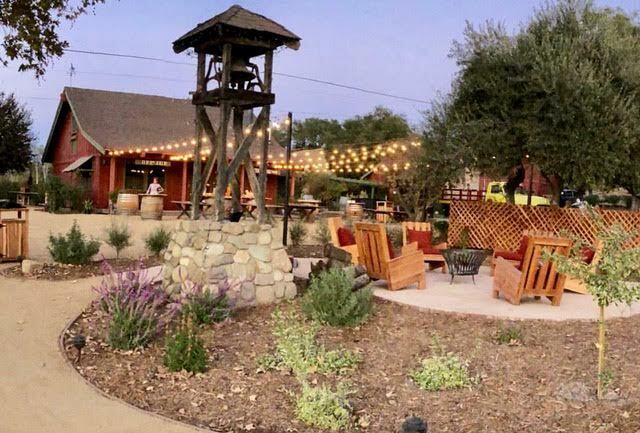 The ranch was bought by the Holguin Family in 2015 and has undergone some lovely changes, including a new wine tasting room and the addition of a grassy picnic area with tables and relaxing couches. The winery features French varietals, including Barbera, Carignane, and Cabernet Franc, as well as Italian varietals like Sangiovese and Nebbiolo, and Spanish Garnacha, using fruit sourced from Santa Barbara and Paso Robles. They are open for tastings on Friday, Saturday & Sunday from 11 am to 8 pm. The ranch is about 13 miles outside of the town of Ojai. To get there, you can take highway 33, or you can meander along the much smaller and more scenic Creek Road, which winds past orchards, vineyards along San Antonio Creek. 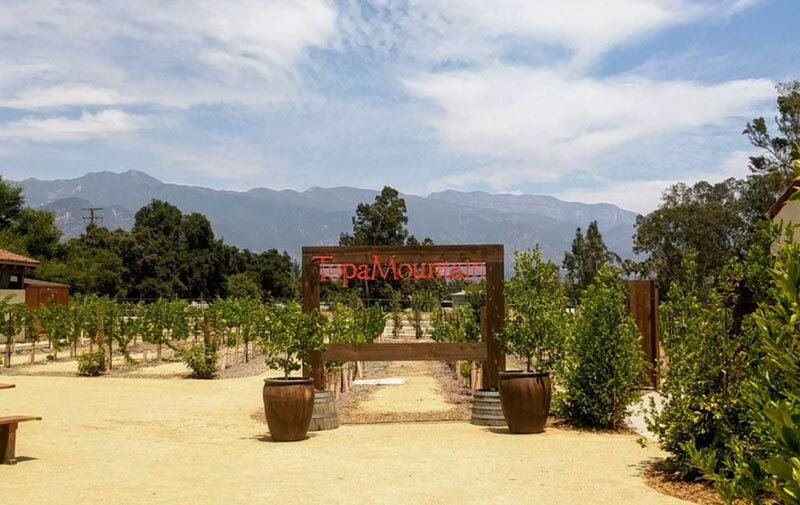 As expected, Topa Mountain Winery is located in the shadow of Topatopa mountain range that skirts its way along this region of Southern California. Taking full advantage of the beauty of the land, Topa Mountain Winery has established itself as a great place to stop along your Ojai wine tour route. They have a lovely tasting room with plenty of outdoor space on the covered patio and surrounding picnic area. On the weekends, you’ll find a very lively scene with live music and families out enjoying the sun. You can bring your children, your pets, and your picnics. The property also opens onto the Ojai Valley Bike Trail, which makes it a convenient stop on a biking or jogging excursion. They have a secure place to lock your bike while you pop into the tasting room for a flight. The tasting room is open Thursday – Monday from noon – 7 pm. Tastings are $15 +tax (subject to change). The downtown area is small, but incredibly charming. It was rebuilt in 1917, after a fire wiped out most of the original town, in the Spanish Colonial Revival style. The design includes a Spanish-style arcade (left side of the photo below), a bell tower (right side) and a pergola (not pictured). The historic buildings have been transformed into modern storefronts for a dozens or so cute little shops, restaurants and wine tasting rooms along the main street, East Ojai Avenue. The Ojai Vineyard tasting room is housed in a redesigned colonial-style building near the end of the downtown area. They’ve been producing wines since 1983. The large room is always full of tasters, sipping and swirling, which is how you know the wine is something special. The first thing you’ll likely notice when you enter the tasting room is the wall of wine that lines the back wall. It’s easy to become mesmerized by the sheer number of bottles. But it’s not just all for show. There are actually 300 different wines that can be bought or enjoyed at the tasting room. A typical tasting flight at The Ojai Vineyard includes five wines. We particularly like their Syrah, but they also have fantastic aged Chardonnay, Pinot Noir, Rose and a sweet Reisling. You can choose a regular or reserve flight for a fee of around $17-25 (subject to change). On the weekends they also feature a flight of some of their library wines. The tasting room is open daily from noon – 6 pm (except Thanksgiving and Christmas). They have tables inside and out where you can enjoy a glass or a bottle with a picnic. Also located on the main street, in the Ojai historic arcade, is the laid-back, colonial-style tasting room of Casa Barranca, where you can sit at the bar or nearby tables to enjoy the flight of 5 unique organic wines, including one of the region’s best Pinot Noirs, a Sangiovese, Cab Franc and Merlot. Casa Barranca is the first certified organic winery in the Santa Barbara region. They make their wine using from organic and biodynamic grapes and a traditional gravity method for racking the wine. As an added bonus, they feature LIVE Jazz in the tasting room on Sundays from 2:30-5:30pm. The tasting room is open every day from 1pm to 6 pm (7pm on Friday and Saturday). If you’re in town on the weekend, you’ll also want to check out Boccali Vineyards. A family-owned winery, Boccali produces 100% estate wines, made from fruit grown on the Boccali Ranch in the Upper Ojai Valley. They are only open for tastings at Boccali’s Restaurant in Ojai (3277 E. Ojai Avenue) on Saturday and Sunday from 11-4 pm. The tasting fee is $10. The event is cancelled for rain. The Boccali family also owns a pizza and pasta restaurant with two locations in the area. As it turns out, Ojai is a bit of an olive oil mecca. There are a few olive oil operations in the region – Regalo Extra Virgin Olive Oil Estate and Ojai Olive Oil Company. You can visit the Ojai Olive Oil Company and try their olive oils at the estate. You can stop by for a tasting and to shop any day between 10am and 4pm. They give free tours three times a week Wednesdays, Saturdays & Sundays from 10am-4pm. There’s no need to book ahead. Tours leave as groups form, about once per hour, and last for around 30-45 minutes. The estate is located about 4 miles outside of town on the east side. To get there head up Ladera Road (off Thatcher Road) and be sure to stay to the left at every fork. Eventually you’ll see signs marking the way to the barn where the tastings and tours take place. Dinner is another occasion to enjoy the great food options in Ojai. You can dine alfresco at The Oak Kitchen, indulge in hearty Italian dishes at Olivella, or grab a seat at Ojai Beverage Company where you can continue your exploration of the area’s beer and wine selection. If you’re planning to make Ojai a weekend getaway (and we highly recommend doing so), you can’t go wrong staying at the Ojai Valley Inn. It has beautiful updated rooms, a nice large pool for those steamy days, and a nice restaurant and bar area. After a full day of eating and drinking in Ojai, I’m sure you’ll come to see how fantastic this area is for a weekend getaway to wine country. Do you know Ojai? What great activities and food and wine-centric gems did we leave out? This entry was posted in Wine and tagged California, USA.